Mission San Luis Obispo may be best known as a landmark of Catholicism, but for eight nights in December, Mission Plaza transforms into an ecumenical hub. EIGHT NIGHTS OF OIL The first candle on the menorah shines bright in SLO's Mission Plaza in December 2017 on the first night of Hanukkah. The 5-foot-tall wooden menorah holding burning candles stands right next to a towering lit-up Christmas tree. A "spin the dreidel" station is steps away from Santa Claus' house. Traditional music of both Christmas and Hanukkah play in harmony. 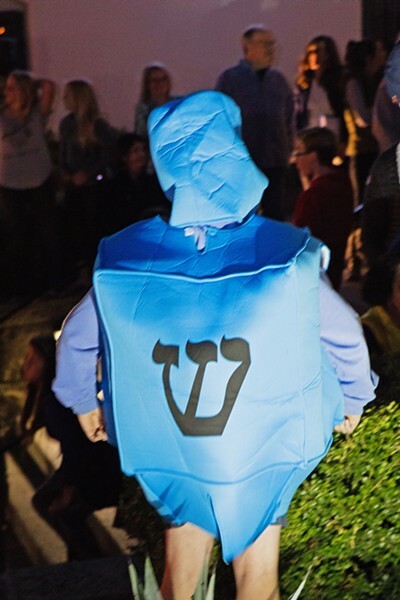 It's a longtime tradition in SLO—called Hanukkah Downtown—that will take place again this year, starting on Sunday, Dec. 2, with a free community party and celebration at 5 p.m.
DREIDEL CHILD A child wears a dreidel costume at last year's Hanukkah Downtown at Mission SLO. In addition to a ceremonial lighting of the first menorah candle and readings about the Hanukkah story, the family-friendly evening will include festive traditions like dreidel spinning, menorah making, and cookie decorating, according to the Jewish Community Center (JCC) of SLO, which hosts the event. A candle lighting ceremony will take place each subsequent night through Dec. 9, the final night of Hanukkah. Hanukkah Downtown came to fruition more than 25 years ago, as an inspired collaboration between Old Mission Church Reverend Jim Nisbet and Congregation Beth David Rabbi Harry Manhoff. "The menorah was actually designed and built by the Mission Church," explained Lauren Bandari, executive director of the JCC of SLO. "Father Nisbet had studied Israeli art and was really influenced by Israeli art. The two of them kind of collaborated to build this menorah and have there be a spot in downtown SLO where we get to celebrate this really joyous holiday of Hanukkah. It's the festival of lights and the miracle of our oil lasting for eight nights, really just fighting for religious freedom. ... A poignant message right now." 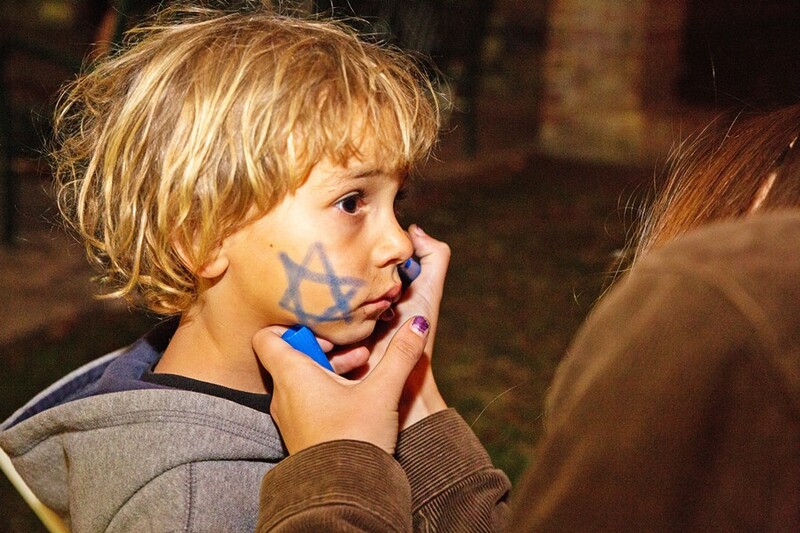 STAR A young child gets a Star of David drawn on his cheek on the first night of Hanukkah in 2017. Hanukkah arrives this year in the wake of a tragic, hate-inspired mass shooting at the Tree of Life synagogue in Pittsburgh, Pennsylvania. On Oct. 27, a man with anti-Semitic views entered the synagogue during Shabbat morning services and open fired, murdering 11 and injuring seven. In an expression of solidarity, Bandari said there will be a station in Mission Plaza on Dec. 2 for community members to write messages of love and condolences to the Tree of Life congregation. 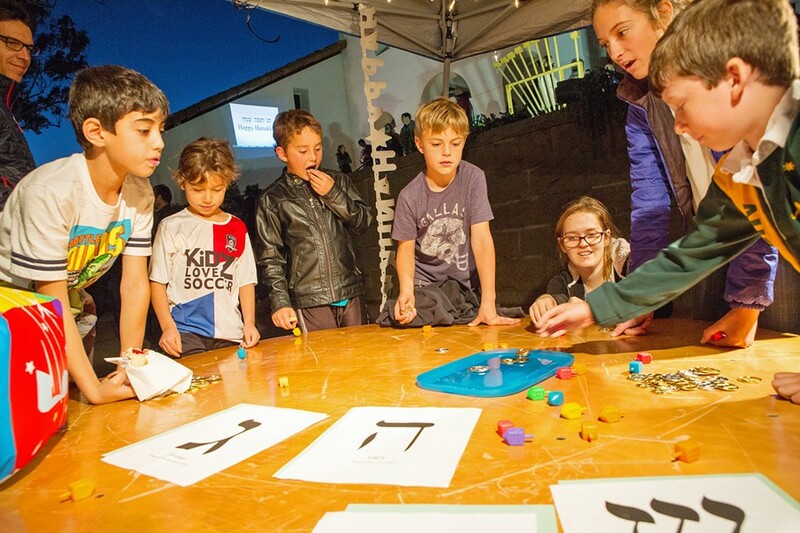 SPIN Kids gather around a table to spin the dreidel in Mission Plaza. The Jewish Community Center of SLO invites the public to participate in Hanukkah festivities like this on Dec. 2. "We'll have a station with all of these cards that say 'shalom,' which means hello, goodbye, and peace in Hebrew," Bandari said. "We'll let people write on those cards, gather as many as we can, and send them from SLO to Pittsburgh." 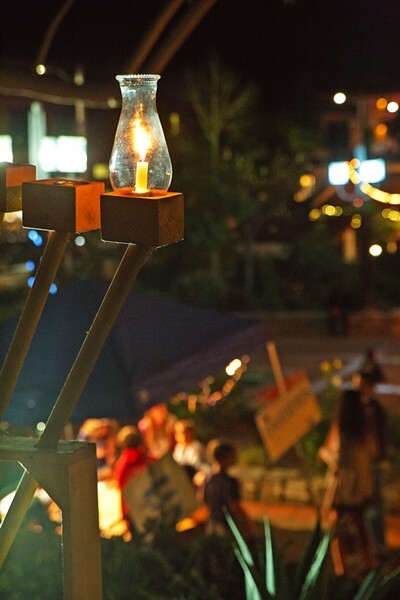 The Hanukkah event won't be the first local public display of solidarity with Tree of Life. The day after the shooting, hundreds of students and SLO community members gathered at Cal Poly's University Union for a candlelit vigil. On Friday, Nov. 2, congregations from Atascadero to Santa Maria participated in a national movement, "Show Up for Shabbat," where hundreds more flocked to synagogues, Jewish or not, "to be there and to stand in support with their Jewish family, friends, or neighbors," Bandari said. "It's been a really beautiful outpouring of support." 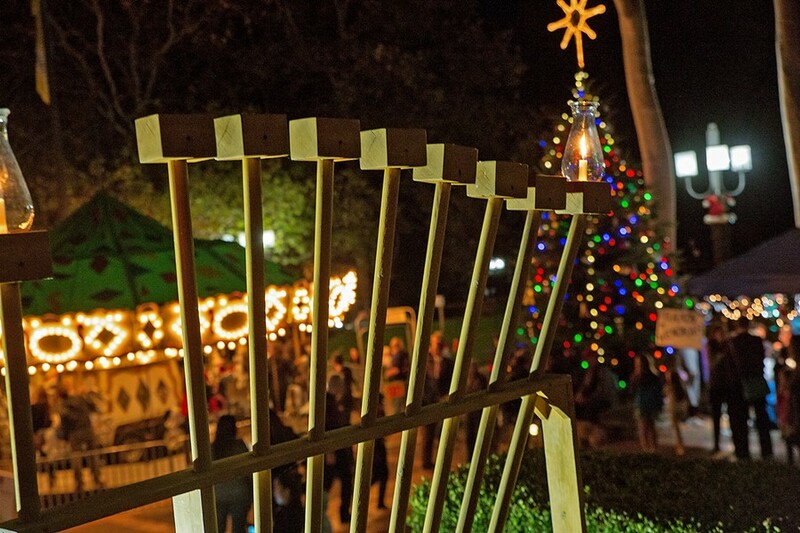 SPECIALLY MADE Old Mission Church Reverend Jim Nisbet and Congregation Beth David Rabbi Harry Manhoff joined forces more than 25 years ago to bring this menorah and a Hanukkah celebration to Mission Plaza. While bigoted rhetoric and hate crimes are on the rise nationwide, Bandari noted that anti-Semitism isn't a foreign concept to the Jewish community. She pointed out that Hanukkah itself is the tale of Jewish people overcoming religious persecution. "Anti-Semitism and hate are not new," she said. "It's this exposed underbelly of our world—not isolated to our country—that is usually kind of tucked in your tight jeans or something. Now it's like totally hanging out." Bandari said the diversity that will be on display in the Mission during Hanukkah will be the perfect demonstration of the type of world we must strive to create. Families from all backgrounds and religions typically attend to celebrate and learn from one another. Assistant Editor Peter Johnson is spinning the dreidel at pjohnson@newtimesslo.com.